For the last six years or so, I have been covering with great interest the development of hydraulic hybrid technologies for on-road vehicles. Some companies have tried to demonstrate this fuel-efficient technology in smaller automotive vehicles, but have found that its use in medium- and large-duty trucks and buses is truly the way to go. One such company I’ve been writing about for years is Lightning Hybrids, Loveland, Colo., a developer and manufacturer of parallel hydraulic hybrid systems for medium- and heavy-duty trucks and buses. This company started out trying to design a compact, sporty car but transitioned into the truck and bus market. 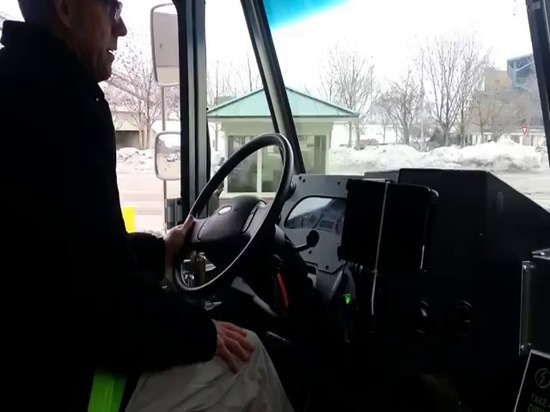 While at Work Truck Show in Indianapolis this week, I had an opportunity to ride in a walk-in delivery truck equipped with the company’s technology. Although I’ve seen vehicles fitted with hydraulic systems like this before, it was the first chance I’ve had to experience it for myself. Check out the slightly bumpy ride and chat I had with Brian Johnson, lead systems engineer below. Yes, hydraulic hybrid technology can be unusually loud in a bus or truck, but it’s not irritating or overwhelming. And the benefits certainly outweigh the noise complaints, said Johnson. As he said, parallel systems like this offer up to 90% decrease in emissions of nitrogen oxides, improved fuel economy up 30%, brake energy regeneration efficiency of 80% versus 30% for electric hybrids, improved brake life, and more. So this it was no surprise that on Thursday during Work Truck Show, the company made a rather large announcement, highlighting an agreement with Kiessling Transit to supply 35 hydraulic hybrid systems, which is the largest order it has received to date. Kiessling Transit’s vehicles, featuring new 2015 and 2016 model year Ford E450 chassis and Elkhart Coach bodies, will have the Lightning Hybrids patented parallel hybrid system installed prior to delivery this summer. The technology, which has no electric batteries, applies a hydraulic system to the driveline of a vehicle to regenerate braking energy. Hydraulic pumps and a lightweight accumulator store braking energy and use the stored energy to power the wheels. 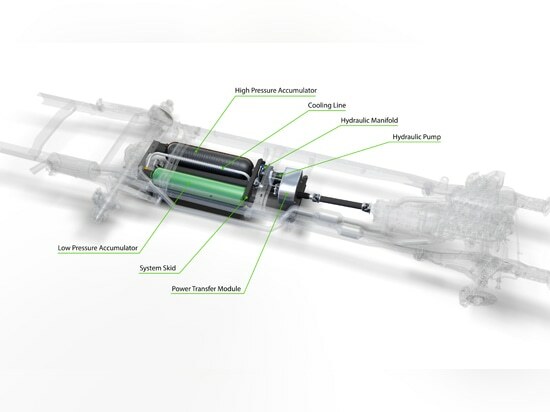 The application of this technology will result in improved emissions, less fuel use, longer brake life, better low-end torque, and lower maintenance and operational costs. When put in service, the buses will provide an immediate positive impact on the environment due to the reduced emissions of the system. For example, compared to vehicles without the company’s system, vehicles with Lightning Hybrids’ technology saw emissions of mono-nitrogen cut in half and an 18% decrease in carbon dioxide emissions. 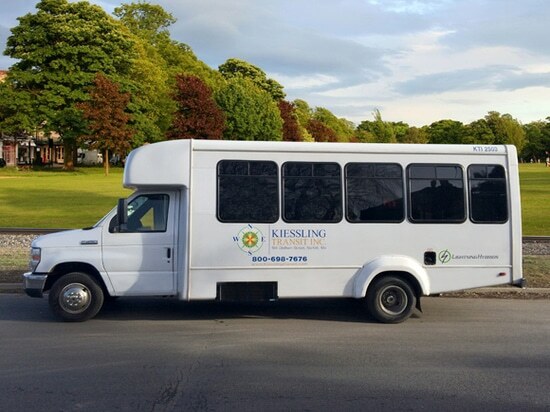 Kiessling Transit purchased a pilot vehicle equipped with the hybrid system through Lightning Hybrids’ Boston-based dealer, National Fleet Hybrids, in 2013. The pilot vehicle’s fuel consumption was closely monitored during the pilot program and the results revealed a significant improvement in fuel economy and emissions. Driver feedback also confirmed vehicle performance benefits. Kiessling Transit will use the hybrid vehicles to transport primarily urban-area Massachusetts residents with disabilities. The company is based in Norfolk, Massachusetts, and currently contracts with regional transit authorities, state agencies and local municipalities to transport passengers throughout the state. 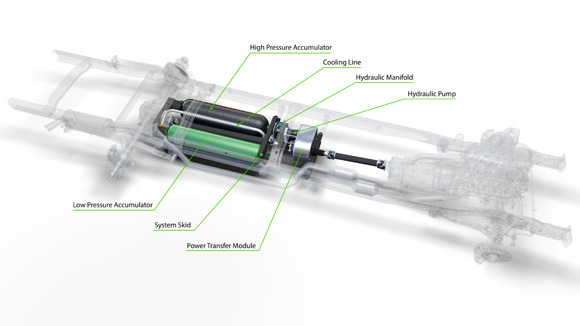 Diagram showing all the different components that make up Lightning Hybrids’ parallel hydraulic hybrid system.